To keep up with the latest happenings, news and tips in the genealogy world, I do read a lot of blogs. One of my favourites over the past year has been Thomas MacEntee’s GeneaBloggers blog. 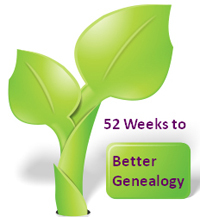 While I do love reading all of his posts, I really love the series that Amy Coffin of the We Tree blog and Thomas have created called “52 Weeks to Better Genealogy” which features on his site. 2010 was Amy and Thomas’ second year of blogging themes, and follows the “52 Weekly Genealogy Blogging Prompts” in 2009. And I’m told that 2011 promises a new series focusing on personal family history, so stay tuned. I have loved this series so much that I wanted to share them with you in case you missed them, so I’ve compiled them all here for you to read, and try out for yourself. I have no doubt some you’ll like, others you won’t, but I guarantee that you’ll learn more about them and possibly yourself in the process. I believe even if you only end up really using a few of these, that has helped your genealogy that little bit more. As this post would have been ridiculously long if I put the full entry for each week in, please click on the title of each fore more details. Happy Researching!! Go to your local public library branch. Make a note of the genealogy books in the collection that may help you gain research knowledge. Go to your local public library branch again. Examine the local history, archives and/or special collections section. Assess yourself! You’re great at researching everyone else’s history, but how much of your own have you recorded? Ensure your own life is as well-documented as that of your ancestors. Learn about your local public library’s inter-library loan (ILL) policy. Pick a genealogy-related book that you want to read that is not in your library’s collection. Ask the librarian how to request the book from another library. Play with WorldCat.org. WorldCat is a massive network of library content that the public can search for free (user name and password not required). Online databases at your public library. Libraries (even small ones) often have wonderful online tools including genealogy databases, historical newspapers and more! Play with Google Maps. This is a helpful tool for determining the locations of addresses in your family history. Discover where your ancestral homestead is or was. Discover online map collections. Historical maps are wonderful tools for historical research. Fortunately for genealogists, many map collections are located online. Pick five genealogy blogs and read them every day. If you already subscribe to many genealogy blogs, find five new ones that are “outside the box,” perhaps in history or archives. Investigate Family Search Pilot, which is part of FamilySearch.org. This is a wonderful collection of records which literally grows every day. Read the back posts from the Transitional Genealogists Forum. This is a message board for genealogists who are taking the steps needed to become professional genealogists. Check out the web sites for the Society of American Archivists, ARMA International, and the American Library Association. You may not be an archivist, records manager or librarian, but you share the same interests. Make an appointment with Cyndi’s List. If you’ve never used Cyndi’s List, take the time to look around. If you’re familiar with the site, look again. Take the time to browse with detail. Use a different search engine for your online genealogy research. Google is the best known one, ut other search engines may provide different results. Try Yahoo! Search, Bing, Ask.com, Dogpile, and even Clusty. Write a letter. It these days of emotionless email, the art of letter writing is getting lost. Pick one of your information needs or queries and write a letter requesting information. Check out the online library catalogue of a university. You may use one close to you, or one in the area of your research. Colleges and universities have wonderful archives, many valuable to historical research. Get out your family photos and label them. You’ve seen them a million times because they’re YOUR photos, but what happens when they’re passed down to others? Will those people know the names of everyone in the pictures? Dip your toe in the social networking pool. Genealogists are some of the friendliest people on the block. Networking with them by using “social” web sites will help your research and provide you with new friends. Examine the “Genealogy and Military Records” page on the National Archives page. (Non-U.S. folks: examine the military records information from your country’s national archives.) Click the links and read everything you can. Play with the Bureau of Land Management (BLM) Government Land Office (GLO) Federal Land Records web page. This is a great resource. Your task this week is to explore the land patents and land surveys sections. Examine the website of your state or provincial archives. Take some time to push all the buttons and click all the links. What did you find? Spend some time at Find-a-Grave. Most of you have probably heard of Find-a-Grave and probably used it in your own research as well. The challenge this week is to simply browse this web site. Read about the differences and understand the different ways of classification. You may have heard of the Dewey Decimal Classification system, but do you really know its nuts and bolts? What about the Library of Congress system? Write one good, solid comment on at least one genealogy blog every day for a week. This week, take some time to read genealogy blogs. Select at least one post a day and establish communication with the author. Offer a compliment, a question or genealogy information you may have. Take a stroll through Google Books. Most of us have probably used Google Books in our genealogy research, but have you really taken the time to explore what’s there? Look at the magazines and featured books. Put your thinking cap on and visit Google Scholar. It’s difficult to browse the features of this tool, so bring some surnames to use in your test searches. Also check out Google Scholar Preferences and Advanced Scholar Search. 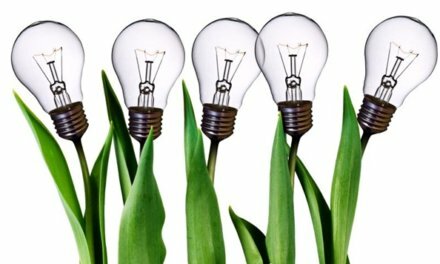 Spend some time with patents and trademarks. If necessity is the mother of invention, genealogists will want to find her parents. Visit the United States Patent and Trademark Office web site (those outside the U.S. can visit their own nations’ sites). Practice reading handwriting. Deciphering the penmanship of our ancestors is an exercise in patience, but this is a great skill to have in your genealogy tool box. Create an emergency chain. Select someone you trust to handle duties should you be unable to access your research, blog or other genealogy projects. Listen to a podcast. A podcast is a digital media file that you can download and listen to any time. There are some wonderful genealogy podcasts including Genealogy Gems and Genealogy Guys. Learn about RSS feeds. You don’t have to understand how RSS feeds work to reap their benefits. What is RSS? Basically, without utilizing RSS feeds, you would need to visit web sites and blogs individually to see if they have been updated. If you subscribe to RSS feeds using a feed reader, the latest updates come to you. Monitor genealogy information on Twitter at least twice a day for seven days. To do this, go to Twitter.com and type #genealogy in the search box. Examine the information being shared and exchanged. Browse Flickr. This is a photo-sharing web site allowing users to upload their photos, tag them with specific keywords and share them with the public if desired. Images pertaining to your genealogy research interests may be on this site. Examine the Daughters of the American Revolution Genealogical Research System (GRS). Even if you aren’t a member of DAR, you can benefit from this wonderful database. Watch Roots Television. This is a wonderful web site that has the look and feel of a genealogy television channel online. You can watch episodes on various genealogy topics right on your computer. Investigate Second Life: a 3D virtual world community. Check out the presentation ‘What is Second Life?’ This learning tool has all the appearances of a video game, but there actually are vibrant genealogy social communities and discussions within the network. Brush up on good genealogy writing tips. Whether you’re planning to write your family’s history or simply ask questions online, good writing is a skill that will benefit your research needs. Investigate how to order an SS5. When someone applies for a Social Security Number, he or she fills out form SS5. When that person (or any other with a Social Security Number) dies, the public can request a copy of the SS5. Review message board posts that pertain to your genealogy interests, or in your local area. One of the best places to browse lists is the RootsWeb index page. Based on the browsing you did last week the RootsWeb index page, write a genealogy query that could be posted on a message board. You do not have to post your query if you do not feel comfortable doing so. The challenge is to practice writing a query that provide good detail information without being too wordy. Brush up on your knowledge of citations. The most detailed element of genealogy is also the most important. Take some time to review articles, books and web sites on the subject. Research ways to give back to the genealogy community. A great deal of genealogy information on line was put there by volunteers. This week, your challenge is to examine some different ways genealogists can donate their time and effort in kind. Examine genealogy societies in your region. Many genealogists belong to their local societies, but it’s helpful to be aware of other organizations within a few hours of your home. Assess your volunteer potential. Take a look at your skill set and determine what types of opportunities best suit you. Do you speak two languages? Maybe you can offer translation services. Do you only have free time after the kids are in bed? Perhaps an indexing project is best for you. Make your genealogy gift list. Prepare a list of genealogy-related gifts you’d like to receive: books, magazine subscriptions, software, electronics, society memberships or anything else that might look good with a bow on it. Examine different online tools for cataloging your personal genealogy library and keeping track of the books you read. LibraryThing is a site where you can catalogue and tag the books in your own personal library. Check out the National Archives Genealogy page. There also is a Start Your Genealogy Research page that may be of interest. Don’t try to do any research, just click links and explore the contents. Check out your regional archives. Last week’s challenge had you checking out the genealogy-related web pages at the National Archives. This week, your task is to explore the offerings at regional National Archives facilities. Think about the goals you want to accomplish next year and write them down. What research steps do you want to take? What records would you like to find? Think about the brick walls you’d like knocked down. Based on the goals you made last week, make a list of the documents and research steps you need to accomplish them. The great way to start a new year is with a to-do list and a plan. I just could not depart your website before suggesting that I really loved the usual info an individual provide on your guests? give your posts more, “pop”! Your content is excellent but with pics and videos, this blog could undeniably be one of the greatest in its field.